Camarón rebozado. Pescado en salsa agrio-dulce. Morisqueta tostada. You would most likely find these dishes on the menu in the first restaurants in Manila, which debuted back in Spanish colonial times. Camarón rebozado is batter-fried shrimp. Pescado en salsa agrio-dulce is fish in sweet and sour sauce. Morisqueta tostada is fried rice. The food was clearly Chinese-influenced — mostly fried and stir-fried in savory sauces as well as soups and noodles — but everything had Spanish names for the sake of the largely Spanish clientele. The very first public eateries were called panciterias, a word derived from pancit, which is the Chinese word for noodles. These panciterias mushroomed everywhere in the bustling city and in the quiet countryside next to panaderias and pastelerias as more and more Spaniards and affluent Filipinos discovered the pleasures of dining out. Filipino food writer Doreen Fernandez called this interesting phenomenon Comida China, or Chinese food. The Filipino favorite arroz caldo, rice slowly simmered with chicken or tripe, is an excellent example of Comida China. The rice porridge, a popular comfort food among Filipinos, is obviously traceable to the Chinese breakfast congee or jook. But like everything else that the Filipinos borrowed, the congee was indigenized. The Filipino version of the rice soup is flavored with fish sauce and served with a sprinkle of local calamansi and loads of fried garlic. According to Fernandez, this Chinese-influenced porridge bears a Spanish name because it “went public” during the Spanish regime. So the next time you enjoy a comforting bowl of arroz caldo con pollo or a plate of crispy camarón rebozado drizzled with salsa agrio-dulce bear in mind the fascinating fusion of cultures in every bowl and in every plate: Filipino-style Chinese food with a Spanish name. My mom makes her batter for camarón rebozado with all-purpose flour but I make mine with rice flour to give it a little more lightness and crispness when fried. 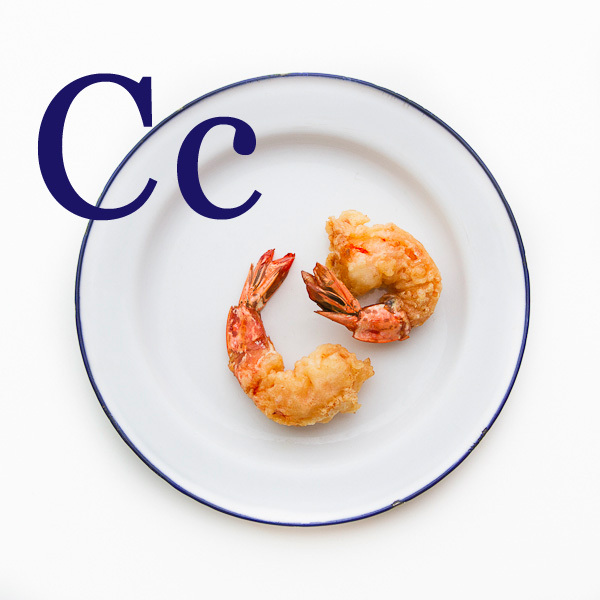 Be sure to fry the camarón right before serving so that it stays light and crisp. 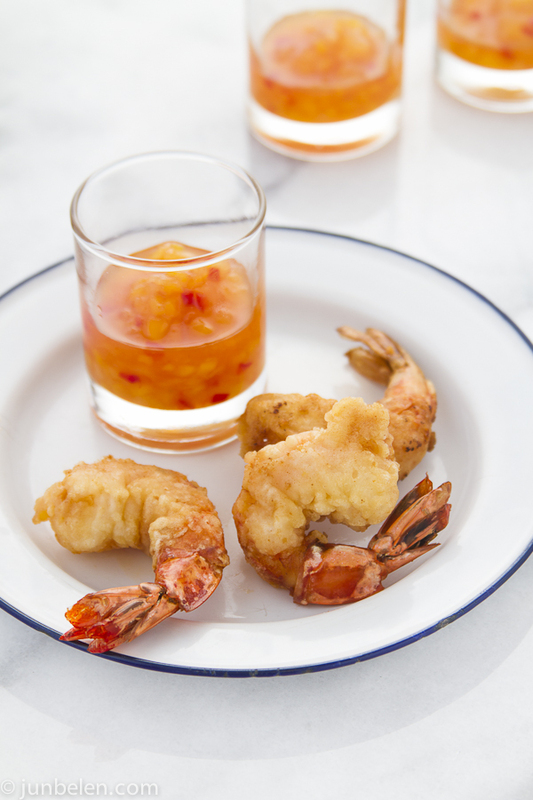 I like to serve the batter-fried shrimp with a mango-pineapple sauce that is actually inspired by William Pilz’s sweet and sour sauce that he serves with his legendary lumpia in his Hapa SF truck. The sauce has sweet notes of fruit and a hint of heat from fresh red Fresno peppers. Wash the shelled and deveined prawns and pat them dry with paper towels. Be sure to leave the tails on. Season the prawns with salt and freshly ground black pepper. Combine rice flour, baking powder, water, and egg in a small bowl. All-purpose flour can be used instead but rice flour makes the batter lighter and crisper when fried. Whisk everything together to a smooth batter. Spread the rice flour on a plate. Dredge the prawns in rice flour and then dip into the batter, letting the excess drip off. Fry the prawns in canola oil until brown and crispy, about three minutes. Drain the prawns in paper towels and season lightly with salt and pepper. Serve immediately to enjoy the crispness of the batter-fried camarón. Serve with mango and pineapple sweet and sour sauce or sweet banana ketchup. Mix the vinegar, sugar, salt, ketchup, mango, pineapple, and pepper in a small saucepan and bring to a boil. Let the sauce simmer over medium-to-low heat until it thickens, about 15 minutes. Adjust the balance between sweetness and sourness by adding sugar or vinegar. Learn the alphabet through our glossary of Filipino food words. So much is lost in translation, I know, but I hope this glossary will help those unfamiliar with Filipino food become more informed. I love your series, Jun! Camaron Rebozado is a favorite here at home, though I cannot enjoy it myself due to allergies. However, I still make them often for the little man. For a while now, I have been making my batter with corn starch, but will definitely try your batter next time. As usual, fabulous post, JB! camaron rebozado a monthly requested dish here at home. I might print out alphabet flashcard version of your series to teach my son his alphabet and Filipino food too. just got really hungry! very nicely done! 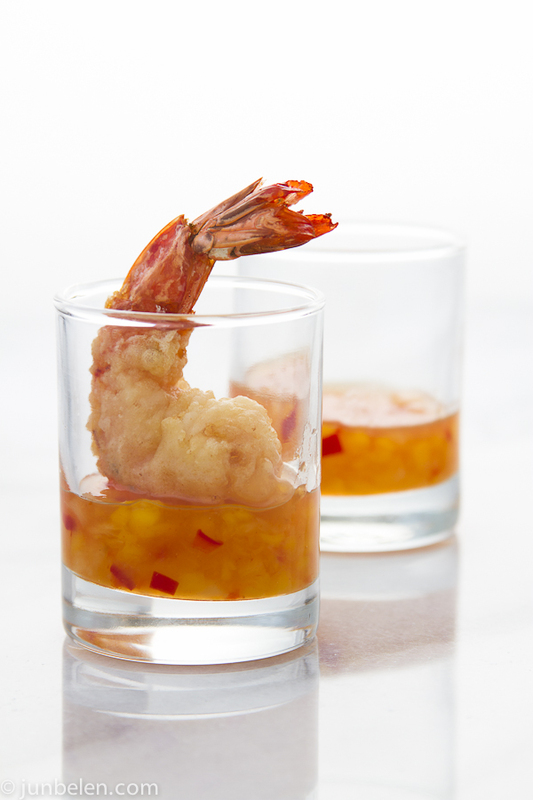 Love the photography especially the pic of the shrimp in the ‘shot glass’ of sauce. Yummy! As always, I live the history lesson too. I still believe Filipino food is the original fusion cuisine. Oh this is so delicious looking! My grandmother used to cook this and it was one of my favorites. Lovely pictures! Thank you, Samantha. And I seriously agree — Filipino food is the original fusion: Chinese, Spanish, Malay, American, Portuguese, and a lot more! Ninang, I didn’t know you have allergies . Sayang. Prawns and shrimp are my favorite shellfish. But I love how unselfish you are by making it for Little Juancho. I can’t wait to see the rest of your ABC series, Jun, but for now, I’ll enjoy looking at your camaron. It’s been a while since I’ve enjoyed these but I can still remember how fun they were to eat. Gorgeous presentation. This is one of my mother’s favorite dishes – consequently, I’ve had a chance to taste a variety. For the most part, I think it’s delicious; however, I love the sound of your recipe using rice flour as some of the batters I’ve tasted were a bit on the heavy side. As usual, your accompanying photographs do a masterful job of illustrating the simple beauty of Filipino food. Beautiful photography and recipe, and I love that you make these with rice flour. The mango pineapple sauce sounds, fantastic too. Love the presentation of the single shrimp in the glass. Looks tasty, too! i love the introduction..cameron rebozado is one of my favorite.. I have a camaron story. Hubs and I were just trying to know each other at that time and I brought camaron rebosado to a party. He loved it so much and siyempre I was pa-impress so I said I made it… weeks into the relationship, he asked me if I could make camaron again but at that time our cook left na.. so OMG nabuking ako hahah. I think it’s not too late to redeem myself by cooking him Camaron again… this time, it’s going to be legit that I made it. Thanks for sharing the recipe Jun!… so what’s D? Danggit? haha! Jun – this looks absolutely delicious!! Loved learning about the history behind the dish. Your photography is stunning . Have a terrific 4th of July weekend! Very delicious.. Little Camaron ..
Looks delicious. thanks for sharing this info.